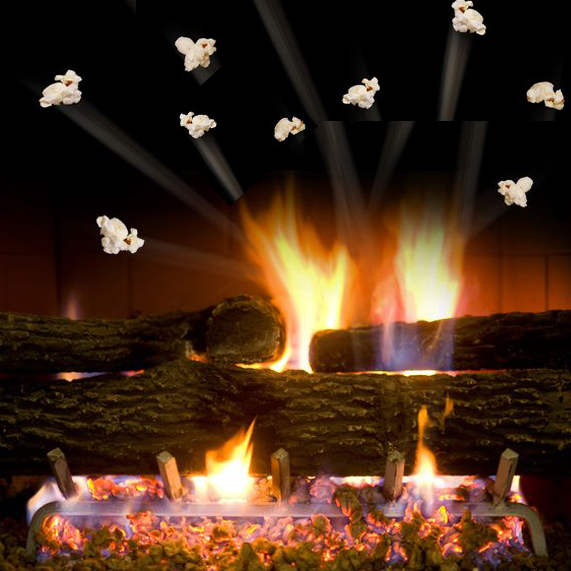 For a retro experience, tasty snack and memorable experience, try popping corn in your fireplace. You can make popcorn in the microwave or on the stove top, but gathering around the fireplace to pop and eat this favorite treat is a warmer, more intimate experience. Even the waiting is more fun. While one of the first foods children learn to cook in the microwave is popcorn, even many adults do not know how to pop popcorn in a fireplace. It’s one of those lost arts worth reviving! You can pop popcorn in the fireplace using a cast iron skillet or thick-bottomed pot with the lid ajar to let steam escape. You can make a popper from a large coffee can by adding a handle (or by using fireplace tongs) and screen wire for the top. These home-made poppers will work nicely, but you will have to keep shaking them while the corn pops to prevent scorching. That means that handles have to be long enough, and strong enough, to let you shake almost constantly and avoid burning your hands. The best tool for popping corn safely in your fireplace is a fireplace popcorn popper made for that purpose. They cost $18.00 to $30.00. 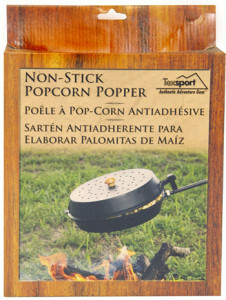 Beware that some fireplace popcorn poppers are for ornamental purposes only, and not meant for actual use. 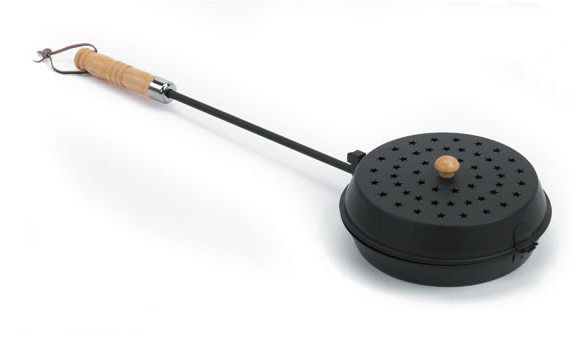 There must be a sturdy handle that lets you hold the popper over the hot coals, never in them. The body of the popper should have a solid bottom and sides so the corn won’t catch fire. The top of the popper should allow steam to escape so it doesn’t make the popcorn tough. The popper must be light enough so that shaking it doesn’t wear your arms out. Prepare your fireplace fire for popcorn popping by building a fire and establishing a good bed of hot coals. It is over these hot coals, not flames, that you will be popping the corn. Always start with a cool popper and cool ingredients. Pour in enough canola oil to cover the bottom of the firep lace popper unless you have a non-stick fireplace popcorn popper. Now add enough popcorn to cover the bottom of the popper. Hold the popper over a bed of hot coals in the fireplace and shake it from front to back. The shaking helps to prevent scorching and filters the un-popped kernels to the bottom of the pan. Keep shaking until the popping slows down. Popcorn is cheap, so It’s better to leave some corn un-popped than to scorch the whole pan full. Don’t be dismayed if your first batch isn’t perfect. With a little practice you’ll learn when to remove the popper from the fireplace with few un-popped kernels and no scorching. Pour the popped corn into a bowl and add your favorite condiments. Melted butter and fine salt are the traditional flavorings. Stir gently with a spatula after adding butter and salt. For variety, flavor the popcorn with parmesan cheese, garlic salt, or a tiny bit of cayenne pepper. If you like, you can add a dusting of turmeric to get that ‘movie popcorn’ color. Highly advanced, top-ranked snackers may want to mix some M&M’s, sesame sticks, cashews, raisins or pretzel pieces in with the popcorn. Now that you know how to pop popcorn in a fireplace, you can celebrate National Popcorn Day, January 19th, with popcorn cooked in your own fireplace. Many of us are reluctant to light a fire in the fireplace, but we’re always glad we did. Sure, there’s a bit of work involved in starting and maintaining a wood-burning fire, but here are ten easy ways to minimize the hassle and enjoy your home fireplace more. 1. Have comfortable seating by the fireplace. We suggest something snuggle-worthy or a rocking chair. Consider a convenient place to rest a drink, bowl of popcorn, or even your feet. If the fireplace and reading are a combination you appreciate, enough light to read by is a must. 2. Make fun a high priority. You can add orange peel or lemon peel to the fire to make a pleasant aroma. 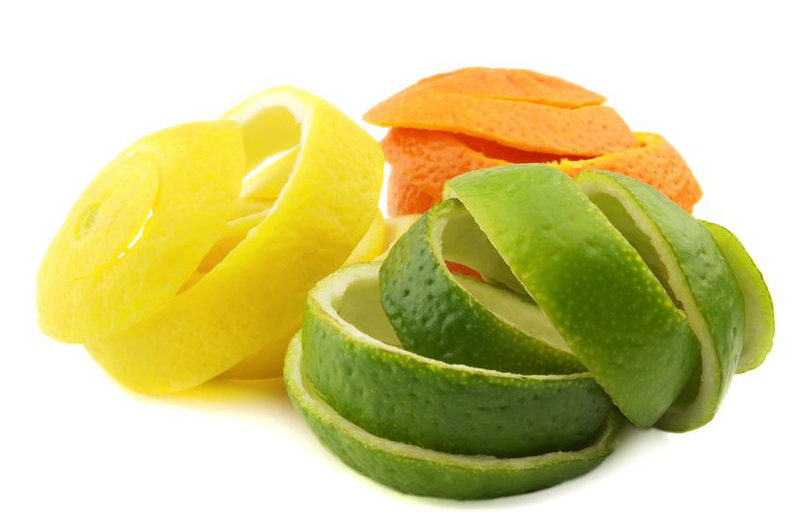 Use the peelings from oranges, lemons or limes to start your fireplace fire. The natural oils are fire-starters and the citrus aroma adds to the experience. Popping corn with a fireplace popcorn popper and roasting chestnuts are two favorite fireside activities. 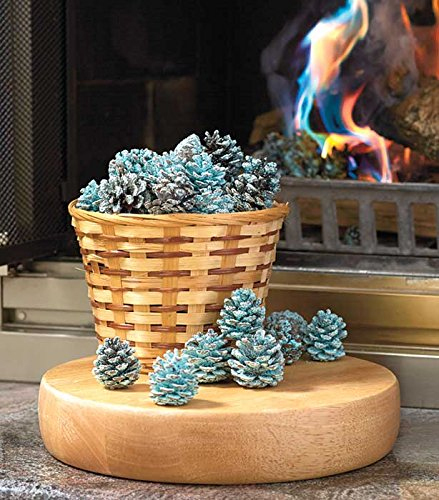 You can buy treated pine cones that make the flames change colors to blue or green. You can even cook snacks or meals in a dutch oven or cast iron pan. 3. Emphasize Convenience. 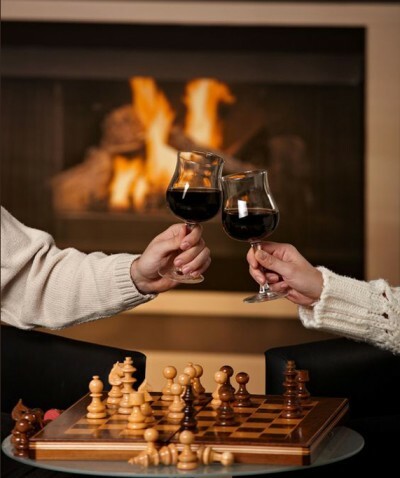 Think of the activities you most commonly enjoy as you sit by the fire, and set up the area to be conducive to them. Love reading by the fire? Have good reading light. Watch television and movies? Keep the remote handy. Play board games? Store them nearby. 4. Use well-seasoned hardwood. Buy freshly cut firewood in the spring, so it will be well-seasoned by fall, when you want to use it. Choose oak, hickory, and other hardwoods because they burn cleanly and evenly. Avoid pine and other softwoods because they can cause creosote build-up in your flue. 5. Keep your firewood dry and well-ventilated. 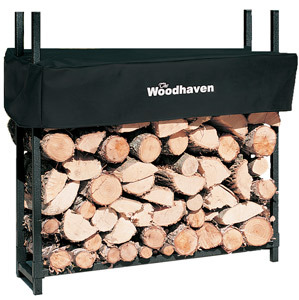 Store your firewood in a log rack that holds it up off the ground and allows air to circulate through the stack. Some firewood racks come with a half-cover that keeps the top few rows of firewood dry while keeping the rest of the stack ventilated. You’ll always have good firewood, ready to use. 6. 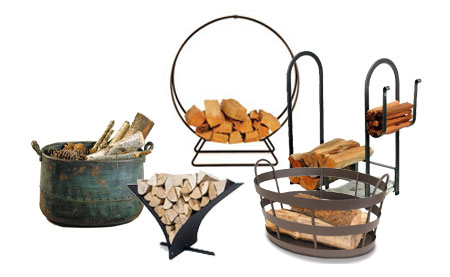 Keep some firewood and fire-making materials right at hand. Use an indoor log holder to keep enough firewood for one or two fires handy. Having some wood handy promotes spontaneous fire-building. Spur-of-the-moment fires are often the most convivial and satisfying. At the beginning of fireplace season, split up a good supply of kindling. Keep some of it, some newspaper, and some fatwood handy so you can start a fire when you feel like it. Use newspaper to ignite the fatwood, which ignites the kindling, which ignites the firewood. 7. Use a fireplace grate. A fireplace grate lifts your firewood above the floor of your fireplace, creating a space to put the newspaper and fatwood when you want to light a fire. As hot air goes up the chimney, it is replaced by air that enters the fireplace under the fire, making your fireplace draft better. Ashes fall through the grate where they can easily be removed. 8. Simplify ash cleanup. Is there a home where some eager soul calls out “Oh, let me! Let me!” when it’s time to remove accumulated ashes? We didn’t think so. 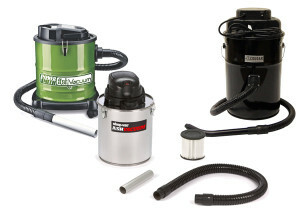 A vacuum designed specifically for ashes makes quick work of the task. 9. Have the right tools for the job. 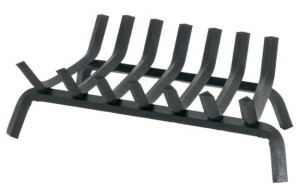 A good set of fireplace tools is indispensable for managing your fire once you have it going. You’ll need a poker, a pair of firewood tongs, a shovel, and a fireplace broom. The poker and tongs will help you re-arrange firewood as it burns down. The shovel makes it easy to clean out the ashes from previous fires. The broom can keep your hearth free of the bark and sawdust that firewood always seems to shed. A pair of long, good quality fireplace gloves allows you to reach into the fireplace to add new logs to the fire, just where you want them. 10. Light your fire early. Light your fire at least two hours before you want your fireplace to produce its maximum heat. It can take several hours for the fireplace bricks to heat up and radiate maximum heat back into the room. Use any or all of these 10 tips to enjoy your home fireplace more. Use your fireplace to create more family-time memories, treasured events with friends, and quality personal-time. Why Won’t My Wood Fireplace Fire Stay Lit…or Light in the First Place? You are all ready for a snuggly fireplace fire, but the fire in the fireplace won’t light! Or maybe your wood-burning fireplace fire won’t stay lit. Either way, use this check list to diagnose why your wood fireplace fire refuses to happen. If you are getting smoke but not flame, your firewood may have too much moisture. Unseasoned firewood has twice the internal moisture that well-seasoned firewood has. Perhaps your firewood has been directly exposed to rain or snow. Just as it would be difficult to ignite a wet rag, it is hard to get moist wood to catch on fire. If you have access to well-seasoned firewood, use it. If you don’t, remove the firewood from the grate. Place the firewood that would not light to the sides of the fireplace grate, but still within the fireplace firebox. Place a composite wax and sawdust fire log on the grate and try lighting it. Do not, however, add an artificial fire log to an existing, burning wood fire. 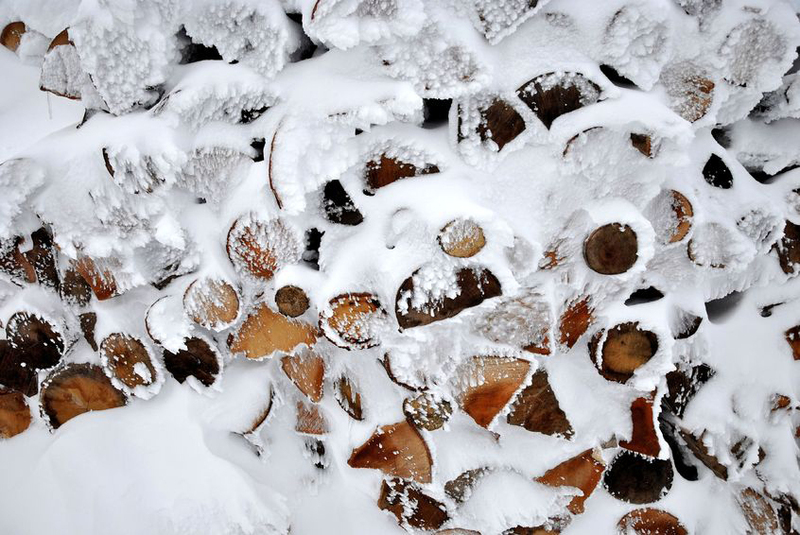 Is your firewood freezing cold? If your firewood has just been brought inside from the freezing cold, it can be harder to get it to light. Bring some of your firewood inside before you plan to use it. Set it by the hearth so it can warm to room temperature before you use it to build your fire. Do you need more or better small pieces of tender? It’s virtually impossible to get logs to light in a fireplace without first getting the fire started with much smaller bits of wood. Include newspaper, twigs and smaller pieces of kindling in your fire, but especially include a few sticks fatwood. Using resinous fatwood makes even a novice fire starter look like a fire wizard! Is your damper open all the way? The damper is the “doorway” between your fireplace and the chimney’s flue. If the damper is closed or only partially open, your fire may not be getting enough air. Is your fire suffering from Cold Chimney Syndrome? If you fireplace fire won’t stay lit, especially if your chimney is on an exterior wall, you may have Cold Chimney Syndrome. If the air in the chimney is cold, you have a column of cold air “blocking” warm air from going up and out the flue. When the warm air can’t go up, replacement air isn’t drawn into your fire. You end up with a fire with not enough air, so it either won’t light or refuses to stay lit. Preheat your chimney. Warming up the air in the firebox up by the damper starts the heated air rising. As it rises, it supplies oxygen to your fire by pulling replacement air from your room through the firewood and up the flue. The safest way to preheat the chimney is to use a hair dryer. Reach inside the firebox and point the hairdryer upward. Turn it on high heat for at least 10 seconds. Turn the hairdryer off before you start to remove it from the fireplace, or you run the risk of blowing fireplace ashes! The more traditional method of preheating the chimney is to create a torch by rolling two or three sheets of newspaper. Light the torch and hold it up high in the firebox. Drop it onto the firewood before the flame reaches your hand. Is there sufficient resupply of air for the fire? Modern homes are built to be energy efficient. Doors and windows are sealed to prevent any cold air from entering the house. But your fire is using air and sending hot smoky air up and out the flue. So your fire needs access to more air to keep the fire going. If your home is sealed too tightly, it can be difficult to start or sustain a fireplace fire. Start by adding oxygen to your fire with a bellows or blow poke. It that may be all your fire needs to catch and sustain itself. If air from the bellows or blow poke helps, but the fireplace fire won’t stay lit when the extra air is removed, air resupply may be the problem. The easiest solution is to crack a window in the room with the fireplace. A more long-term solution is to install an air resupply ventilator in the room. It goes through the wall, has noise and air filters, and allows you to adjust the amount of air to the minimum you need. 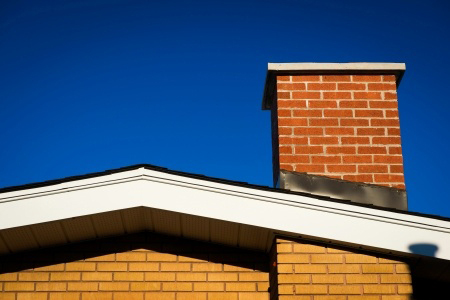 Is your chimney at least 10 feet tall, at least 3 feet above the roof, and at least 2 feet taller than anything within 10 feet of it (such as an addition, dormer, neighboring home)? If your chimney was not well designed originally – or if home additions have subsequently interfered with its functioning – you may find it difficult to get a fire going in your fireplace due to poor drafting. Sometimes this will manifest itself by sending smoke into the room (instead of up the chimney) when you try to have a fire. In some cases, a flue extender (a chimney cap with a 22” or 34” tall base) can correct a chimney height deficiency. Other times, a chimney exhaust fan such as an Enervex fan is the only thing that will overcome a chimney with a poor-drafting design. 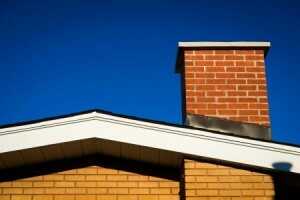 A chimney with an obstruction may not be able to pull enough air through it to keep a fire going. Everything from a crumbling flue tile to an animal’s nest could be obstructing your flue. A chimney cap will keep critters out of your chimney, but only a chimney inspection can reassure you that there’s nothing in the flue blocking the flow of air. Have a certified chimney sweep conduct at least a Level One (visual) if not a Level Two (video) Chimney Inspection. It is both frustrating and disappointing when you have your heart set on a relaxing time by a fire, and the fire just refuses to spring to life or the fireplace fire won’t stay lit. Be sure you start with dry firewood and fatwood. 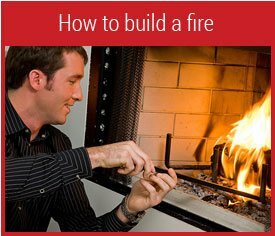 Also, make certain you have a good draw of warm air flowing up the chimney, thereby pulling adequate resupply air into your fire. 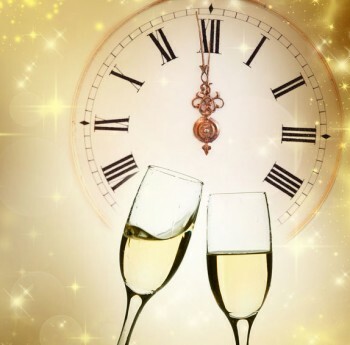 The clocks are set for almost midnight…the start of the new year. 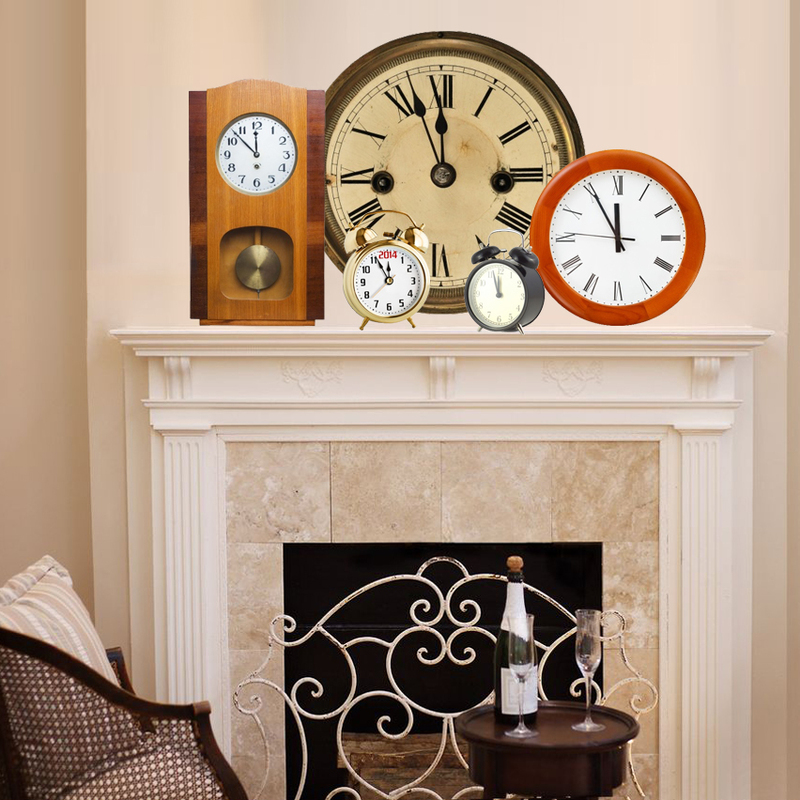 Gather clocks from around the house – everything from old alarm clocks to kitchen wall clocks. Set each clock for almost midnight and arrange them on the fireplace mantel. It’s simple but a real eye-catching way to welcome in the new year. Replace the Christmas stockings with numerals for the new year. Did Christmas stockings adorn your fireplace? Simply reuse four of the stocking holders to hang craft numerals of the New Year! The switch-out takes but moments. The fireplace above uses silver numbers, accenting the grays in the wall and hearth, but feel free to use anything from cardboard cutouts to rustic wooden numbers, depending on your decor. If there are candles and evergreens on top of the mantel, just leave them there through the New Year’s celebrations. 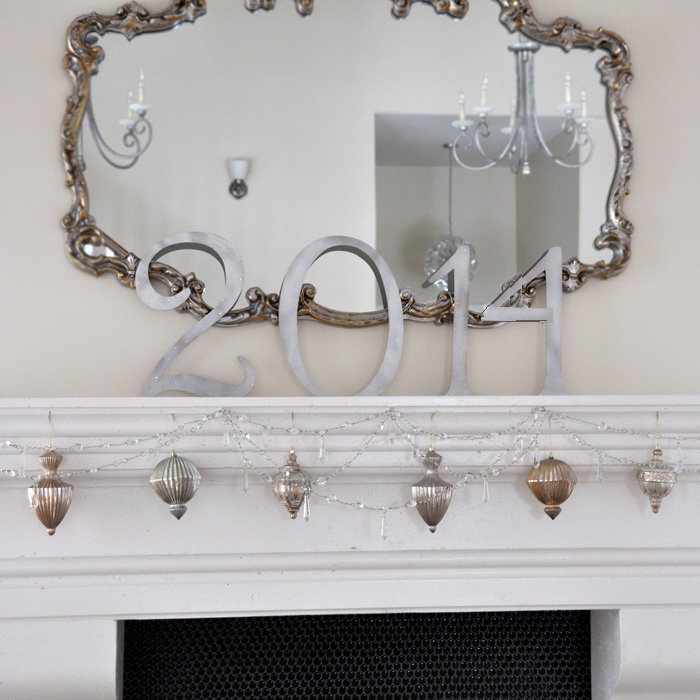 If you already have a mantel mirror, incorporate it as part of your New Year’s decorations. Inspired by CreatingCupcakes‘ 2011 New Year’s fireplace mantel, the one above uses the mantel mirror as an important component of the New Years decorations. Note that the decorations hanging from the mantel, the mirror frame, and the numbers for the year all carry through on a gold and silver color scheme. If you have an existing mantel mirror, consider placing numbers for the New Year either in front of it (as above) or hanging from the the top of the mirror’s frame with fine thread or mono-filament line. White numbers on black backgrounds within wooden photo frames, standing on the fireplace mantel. 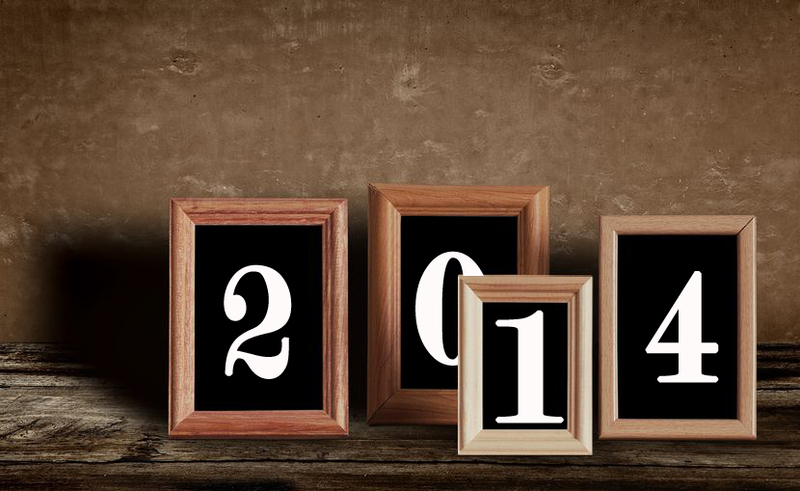 Identical black frames, each with one of the year’s numbers, line ta modern mantel. 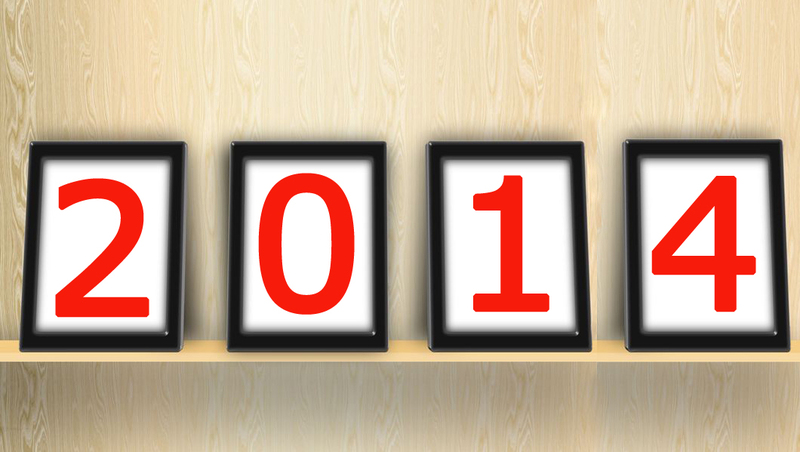 Give each number of the new year its own picture frame. Use similar frames (such as all wooden frames, or all antique frames, or all white frames) or identical frames to get the look you want. Note how you can position the frames so they are slightly overlapping or so they are meticulously, evenly spaced along the mantel. We like the drama of white numbers on a black background, but that can use up a good deal of printer ink. Instead, print out white letters, cut them out, and paste them on a black background. Since these framed numbers are not permanent decorations, you don’t even need to add glass to the frames. Soften the look of the photo-framed numerals by unrolling streamers that work with your New Year’s color scheme and loosely cluster them on and among the frames, allowing ends to dangle casually off the edge of the fireplace mantel. Or sprinkle confetti on the frames and mantel. 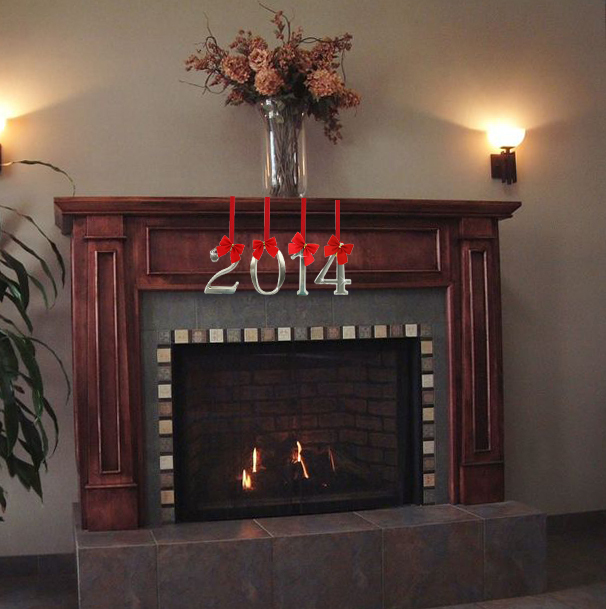 Simplify decorating a fireplace mantel for New Years with any of these quick ways to welcome in the New Year. We’ll toast to that!